Coach Hayden Chandley holds the musket high as David Crockett High School’s Pioneers brought in a win Friday, with a final score of 34-27. Though in the past, rival Daniel Boone High School seemed to walk away with the musket one too many times for Crockett fans’ comfort, this year it was all about DCHS and a team that has so far proven unbeatable. 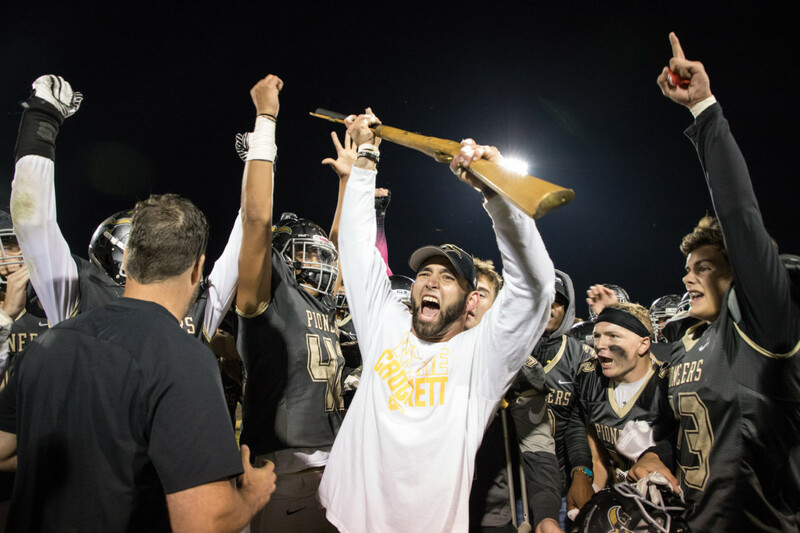 David Crockett’s football team will be taking aim at the program’s first undefeated regular season Friday, and now it has a musket to finish the job. In a Musket Bowl exceeding the hype that helped fuel cars being lined up from David Crockett to downtown Jonesborough some 80 minutes before kickoff, the Pioneers improved to 9-0 on the season and clinched Region 1-5A’s top playoff seed with a 34-27 defeat of Daniel Boone on Friday at Pioneer Field. The David Crockett High School Pioneer Football Team topped Daniel Boone High School in a thrilling Musket Bowl match up. The home win keeps Crockett undefeated as they continue their season with a 9-0 record, a program best. The victory also assured Crockett (5-0, 9-0) at least a share of the Mountain Lakes Conference championship, which it can clinch outright with a win at Morristown East in the regular season finale on Friday. Boone (4-1, 7-2), which will also host a first-round playoff game as the No. 2 seed, will host Cherokee on Friday. Crockett’s defense was missing leading tackler John Kollie against Boone. The timing of his suspension created as much controversy as Washington County’s heated rivalry has seen since the 2015 Musket Brawl that landed both teams postseason bans. The Pioneers also lost fellow captain J.R. Giles – a disrupter on defense – to an injury in the first half. But the Trailblazers and Pioneers each appeared focused and composed, and there were no shenanigans in a critical game despite the body-jarring hits of players such as Crockett’s Tony Davis and Prince Kollie. Cade Larkins completed 33 of 47 passes for 410 yards and four touchdowns and fellow junior Donta Hackler tallied 12 receptions for 167 yards and three TDs. 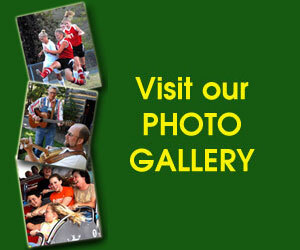 “This is the happiest I’ve been in a long time,” Larkins said. Hackler’s 41-yard TD catch with 2:38 left on a second-and-10 gave Crockett a 32-27 lead, and Mark Seidler’s two-point conversion reception from Larkins concluded the scoring. Crockett’s quarterback, Cade Larkins, gets ready to pass during the Musket Bowl game as Boone’s Charlie Cole (4) and Peyton Nickles (2) prepare to block. Crockett seemed to be in control when Hackler’s 15-yard TD reception gave the Pioneers a 26-14 lead with 7:31 to go. But junior Charlie Cole, a bruising speedster, dashed 74 yards for a TD on the ensuing play from scrimmage. Crockett blocked the PAT kick to preserve a 26-20 lead. However, three plays later, the Trailblazers’ Daniel Lusk made a diving interception at the Boone 42-yard line. Two plays after the turnover, quarterback Easton Harrell dashed 56 yards for a TD. The PAT gave the ‘Blazers a 27-26 lead with 5:18 left. Senior receiver Micah Robinson had eight catches for 106 yards and a TD. Sophomore Prince Kollie made eight catches for 90 yards. Boone was led by Cole, who rushed for 170 yards. Harrell added 133 yards and two TDs, and Brennan Blair’s 6-yard TD run via a reverse got Boone within 20-14 with 10:24 to left. Boone’s coach was impressed with a Crockett squad that didn’t quit or panic when Boone rallied to take a one-point lead. Certainly, a rematch would make for a massive gait. There was surely more than 10,000 at Crockett on Friday. But Larkins and company always answered. Robinson’s 28-yard TD catch.